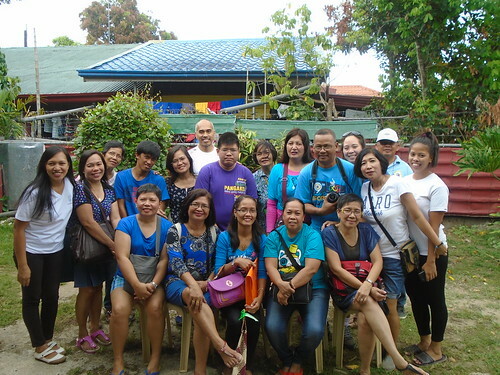 Autism Resource Center (ARC) of ASP Laguna welcomed visitors from Legaspi City Social Welfare and Development Office (CSWDO) and The Bridge Community represented by Arnel and Tiena Megino last 15 April 2015. Ms. Merlene G. Menaya lead the visit as part of the “Annual Skills Enhancement and Exposure Tour” accompanied by Los Baños SWO III, Ms. Hanna Erika Erasga-Lavinia. It started with the orientation by the ASP Laguna Chapter President, Ms. Cathy Lopez. The group joined the trainees in the Aerobics activity headed by Ms. Deborah Sanchez, ARC Program Assistant and Ms. Ardee Deang, one of the volunteers of ARC. Quoted by one of the visitors, “I like this activity, it was such a wonderful experience to join the young adults with disabilities in executing physical activities. It reminds me to be health conscious as I shed sweat and followed the movements of the upbeat music”. After spending time with the trainees, they were grouped into three and had a tour of the different stations. Ms. Vay Chavez explained the diner services in station 1; while Ms. Debs Sanchez shared the information on arts and crafts in making angel products in station 2. She also explained the process in maximizing scrap paper in making paper briquette. On the third station, Ms. Cathy Lopez elaborated more on the office and messengerial works. An open forum was held after the tour followed by filling up of evaluation forms. The tour in ARC ended with a photo op with the visitors. Together with a parent and ARC volunteer, Mr. Eman Teodoro, they headed to Los Baños Community Center for Therapy Interventions and Support Services (LBCCTISS) located in Barangay Baybayin. Mr. Genaro Calderon, a parent leader, gave a short briefing on the history of the Center and its services. The group familiarized themselves with the facilities with the help of LBAPCD (Los Baños Association of Parents of Children with Disabilities) officers, Ms. Sally Solinap and June Gupo. Ms. Amorlina Cotoner also joined in welcoming the guests. The guests visited two centers: ARC and LBCCTISS. ARC is one of the programs of ASP-Laguna Chapter which provides a work, live and play program to young adults with autism and other disabilities. On the other hand, LBCCTISS is one of the projects of ASP Laguna Chapter in partnership with the local government and a foreign grant support. LBCCTISS, inaugurated last 17 September 2014, caters to children with disabilities age 13 years old and below. The couple Arnel and Tiena Megino expressed their intention to volunteer with ASP Laguna Chapter on its activities during their stay, which will last until August 2016. The couple are part of The Bridge Community, which is involved in water filtration ministry in the Philippines through its “Isaiah Project”.